When a pious young nun comes to Angelo to plead for the life of her doomed brother, she sets in motion a series of events that test the limits of human will, and reveal a tangled web of desire and deception. See it if you’d like to experience a stripped-down, clear rendering of Shakespeare’s #MeToo play. Don't see it if small theater spaces intimidate you: the audience is so close here that it just about becomes a character in the drama. Don't see it if You hate Shakespeare or can't tolerate tiny theatres. A little slow prior to intermission, things really pick up in the second act. See it if the pleasure of watching Shakespeare done simply and intimately works for you. Don't see it if you are bothered by a small cast doubling roles. And obviously don't see it if you hate Shakespeare. See it if like an energetic and modern take that stays true to MFM while highlighting themes that may not be as traditionally highlighted. Don't see it if You do not like MFM, have trouble following Shakespeare, have seen it recently, like traditional takes, or don't like actors changing sets. See it if Sexual politics, lust and repression in this dark but accessible production of the play which keeps things light as often as possible. See it if you would like to enjoy a modern version of the play with solid acting, interesting staging with good lighting - the best I've seen. Don't see it if a long play will strain you. The action is sharp and well directed, but your comfort will be tested. One actor w/accent hard to understand. See it if You like Shakespeare and always try to see his stuff. Don't see it if Well, it's not the lighthearted story that you might get from some of his other comedies, and this production is darker than most. See it if A updated of the telling of a Shakespeare dark comedy, with good acting. Don't see it if Shakespeare not your thing. Its long. See it if want to see different approach to the traditional play.Mr.Walker is very good as director and Duke/Monk. Also Applause to all actors for memorizing such difficult and long monologues! See it if If you like Shakespeare, this is a very dark rendition of measure. Cast, direction is pretty well done. Don't see it if If your not into plays on the longish side. Deep Shakespearean writing. See it if you like this particular Shakesphere play and like supporting smaller production. Don't see it if you're not patient enough to sit through 2+ hours. can't endure uneven performances. don't like trying to decipher shakespearean language. See it if Phenomenal production. Had me on the edge of my seat. Don't see it if A little long. But well worth it. See it if This is the kind of production that makes me happy that I sometimes go to the theater. Well worth the time, and well done. Don't see it if Why would I tell you not to see it? See it if you like to see Shakespeare set in a contemporary(ish) setting. I found the show to be well paced and most of the dialogue was clear. Don't see it if well - the staging is pretty bare and the show runs a good 2.5 hours. See it if The company was especially strong and talented. Especially Brandon Walker, Sabrina Schlegel-Mejia, Robin Friend, and Will Ketter. Don't see it if It took a little while for me to get into it, so don’t see it if you’re not into Shakespeare or problem plays. See it if I have never seen this problem play"performed as well as this. Well directed, and very organic. Don't see it if It is long (2-1/2 hours), and Act I takes some time for traction. Some uneven performances, and strange meta actions by the lead don't read. See it if Relavent and we’ll done. Don't see it if Maybe could have used some cutting here and there. See it if you like clear storytelling. Don't see it if You need to be in a big space, in a traditional audience setting. See it if I really enjoyed this performance. I wasn’t expecting much and don’t usually like Shakespeare, but I was really into it. Don't see it if It runs a little long but totally worth it. 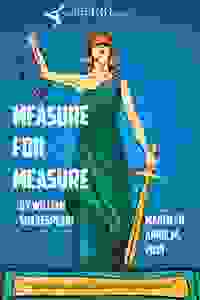 See it if You are looking for Measure for Measure. It is Shakespeare done well. Don't see it if You want a grand experience, you will get an intimate experience instead.